Have questions about traveling to Africa? Check out our FAQ’s for answers! Since this is a photo tour you will be bringing equipment above and beyond what a normal game viewing safari would require. A detailed list and more information can be found here. For international travel, most airlines allow checked luggage with a maximum length of 62 inches weight of 50 pounds per bag. Check your carriers website for more information. For smaller internal flights, there is a baggage restriction of 33 pounds per person. Excess luggage is charged at $2 per pound if it can be accommodated on the flight. On most tours we WILL be taking an internal flight at the end of the tour. We recommend packing light and to keep in mind this 33 pound limit. No formal clothes are needed and laundry services are available at most lodges and camps either free of charge or for a small fee ($2 – $3 per item). Please read below an excerpt from KLM Airlines regarding carry –on luggage. Avoid packing camera equipment or CF Cards in your checked in luggage. If you do have to check your camera equipment be sure to have airline approved cases for protection such as Pelican Cases. If you decide to check in your luggage, please protect yourself from the consequences of the airline losing your luggage by packing critical items and also two changes of clothes in a carry-on bag. What if I forget something or my luggage is lost or delayed? You are flying to a remote location where it may be impossible to purchase items in the event you forget something or your luggage is lost or delayed. Make yourself a checklist and pack with care. IMPORTANT: Delayed or lost checked luggage is possible on international air carriers (i.e. KLM and British Airways) arriving into Kilimanjaro, Nairobi or Dar es Salaam. We recommend that you carry – on as much as possible. We recommend one 22 inch suitcase (normal carry – on size which fits in typical overhead bins) and one separate camera bag and/or shoulder bag per person. If you choose to check in your luggage, it is essential that you carry – on ALL important items, including but not limited to: prescription medicine , camera equipment, essential toiletries, and at least two separate changes of clothing. You are allowed to carry – on 3 oz containers of any toiletries you may need such as sunscreen or contact lens solution in a single, quart – size, zip- top, clear plastic bag. As you pack, ask yourself “would my trip be ruined if I did not have this item?” If the answer is yes, pack it in your carry – on bag!! Small medical kit including aspirin, antimalaria pills, cold and allergy medicine, cream for itches and rashes (i.e. Benadryl itch relief stick), bandaids, stomachache medicine (i.e. Imodium), probiotic, prescription antibiotics effective against a broad range of bacteria including travelers diarrhea (i.e. Ciprofloxacin commonly known as Cipro), and any prescription medications. Tours filled with wildlife viewing are extremely informal and the main goal is to pack lightly and smartly. Loose fitting, casual and comfortable clothing is recommended. There is little or no opportunity for fashion while on a tour though you may wish to bring a nice outfit for a special dinner. All the lodges allow casual clothing and traditional safari wear while dining. Some lodges and camps will launder your clothes for free or a small fee ($ 2 – $3 per item) within 24 –hours. Be prepared for daily highs ranging from the mid 80’s and lows in the 50’s and 60’s except during the cold season (June, July and August) when the lows can drop down into the 40’s. At higher elevations it can significantly colder during the night and early mornings (7,500 – 8,000 feet). There is a large temperature range each day and it is recommended to wear layers enabling you to adjust to the varying temperatures. It can be quite cold on early morning game drives and long pants and a warm sweater are needed. In contrast, shorts and t-shirts can be worn on afternoon game drives as it can get hot during mid day especially with the strong equatorial sun shining down in a convertible vehicle. It is important that you wear a wide brimmed hat and apply sun block frequently to all exposed areas. Dark colors tend to attract unwanted insects. The tsetse fly (active only during the day) is attracted to dark colors (primarily dark blue) so these should be avoided when game driving in tsetse areas including the woodlands of the West Serengeti, Tarangire and few parts of the North Serengeti. We recommend you wear long pants and shirts when game driving an area known for concentration of tsetse flies. Lighter and more natural colors such as khaki, brown, beige, olive and green should be worn during the day. During the nights, the color of your clothing is irrelevant. From dusk to dawn, it is recommended that you protect yourself from mosquitoes by wearing pants, long sleeved shirts, socks and shoes plus insect repellant. If you book 90 Days or more prior to departure we require a non-refundable deposit to hold your spot. Your non-refundable deposit is payable by Credit Card, Paypal, Money Order, Cashiers Check, or Bank Wire Transfer. Your remaining balance is payable by Credit Card, Paypal, Money Order, Cashiers Check, or Bank Wire Transfer. You are responsible for any fees incurred by your bank. If you book within 90 days of departure, payment in full must be made by Credit Card, Paypal, Money Order, Cashiers Check, or Bank Wire Transfer. You are responsible for any fees incurred by your bank. A non refundable deposit is required upon booking. Your deposit is payable by Credit Card, Paypal, Money Order, Cashiers Check, or Bank Wire Transfer. You are responsible for any fees incurred for bank wire transfers. Your balance is due 90 days prior to departure. Your final payment will be accepted by Credit Card, Paypal, Money Order, Cashiers Check, or Bank Wire Transfer. You are responsible for any fees incurred for bank wire transfers. If full payment is not received 90 days prior to departure, Capture Africa Tours reserves the right to cancel all arrangements without refund of any deposits received. If you book your trip within 90 days prior to departure date, the entire trip amount must be paid in full immediately upon booking. Payment will be accepted by Credit Card, Paypal, Money Order, Cashiers Check, or Bank Wire Transfer. You are responsible for any fees incurred for bank wire transfers. You may request information or secure your spot through any featured tour page on the Capture Africa Tours website. Or contact us at info@captureafricatours.com for questions and booking information. You may also send us a message to learn how we can customize a trip for you. We will send you our tour booking form and other important paperwork and information about the trip. Once received, return your signed paperwork with deposit payment and you’re spot is reserved! What are the Visa requirements I need to know? A passport and visa are required for U.S citizen travelling to Kenya, Tanzania, Rwanda, Uganda, Zambia, Zimbabwe & Ethiopia. Your passport should be valid for at least six months past your arrival date. Please make sure you have at least 2 blank pages in your passport. Presently US citizens DO NOT require a visa for Botswana, South Africa, Namibia, Seychelles, Mauritius, Morocco, and Malawi. Please note that all travelers flying to Tanzania via or in transit through a Yellow Fever Infected country such as Kenya, Ethiopia and Uganda are required to show proof of the Yellow Fever Vaccination Certificate. For example, this would include those persons flying to Tanzania trough Kenya, Ethiopia or other African countries. It is important that you check your Visa Requirements for Kenya, Tanzania, Rwanda, and Uganda. Capture Africa Tours, will not be held responsible for failure to meet visa requirements. Stay away from visa companies because they charge too much and their turn around time can take weeks to months to get your visa back. These can be obtained at the airport or border crossings without any problems. There may be a small delay because you won’t be the only one obtaining a visa on that day. The Kenyan Embassy is asking all tourist to obtain their eVisa online from eCitizen before entering their country. The Ugandan Embassy also asks you to obtain a visa prior to entry from their website. If you have any questions on Visa requirements, please contact us at info@captureafricatours.com. The majority of the costs on your trip are included in your package. You should bring U.S dollars in both large and small denominations to pay for any additional expenses. Change for large denominations may be difficult. We recommend bringing enough US dollars plus an additional cushion amount to cover all additional expenses just to be on the safe side. Please make sure to bring crisp, new vintage bills dated 2006 and later as many shops, hotels and banks will not accept older bills due to counterfeiting problems. Tourist Visa’s are required in both Tanzania and Kenya. A tourist entry visa to Tanzania is $100 USD. A tourist visa to Kenya is $50 USD. These fees must be paid in cash when you arrive in each respective country unless you’ve purchased prior to the trip. (We recommend purchasing when you arrive.) These can be obtained at the airport or border crossing without any problems. There may be a small delay because you won’t be the only one obtaining a visa on that day. We recommend you bring extra one- and five-dollar bills in a separate accessible envelope. Extras on your safari, including drinks, are not included. (Typically $2 – $3 per bottled water or soft drinks, and $3 – $8 per bottle/glass of beer, wine or spirit). Bottled water at meals served from the lodge or camp is considered a bar item and not included at those lodges and camps that do not include all drinks. Other extra items are laundry ($2 -$3 per item are not included), souvenirs (many under $5 but can be much more) and miscellaneous tips (individually under $5). At your discretion, tipping your guide drivers can range from $15 – $25/day per person. It is also customary to tip the lodge $10 – $20/day per person. Your upcoming trip is a significant investment, which involves risks. For this reason, we urge you to purchase a comprehensive travel insurance plan valid for the entire duration of your trip. This insurance should cover you for events such as trip cancellation, delay or interruption, lost or delayed baggage, emergency accident, illness evacuation, 24 – hr medical assistance and traveler’s assistance. Membership to the AMREF Flying Doctors Emergency Evacuations is included in your tour package price. The AMREF’s Flying Doctors Emergency Evacuation Program ONLY covers the cost to evacuate casualties from emergency site to the nearest hospital by air or ground ambulance but does not cover further costs. Your personal medical insurance policy may not cover you while overseas. Additional coverage may be needed and is suggested. Deposits are non-refundable and cancellations can happen. Be prepared! Here are links to companies that offer supplemental travel insurance policies. Capture Africa Tours, receives information and updates directly from the World Health Organization (WHO), a specialized agency of the United Nations (UN) that is concerned with international public health. WHO reports indicate that the most severely affected West African countries are Liberia, Sierra Leone, Guinea, and Nigeria; all in West Africa. The US Department of State (DOS), the United Kingdom’s Foreign & Commonwealth Office (UK FCO), and other similar international bodies are NOT advising against travel to any Capture Africa Tours’ destinations; located in East and South Africa. Your safety is always our number one concern and priority. We remain in constant contact with these organizations and our partners overseas to remain informed and updated so you can rest assured when you travel with Capture Africa Tours. Dehydration is one of the biggest causes of travel fatigue and jet lag. You should not drink any other water (tap, etc) other than bottled water. You should not even brush your teeth with water from the tap. There is unlimited bottled water stocked in your private vehicle for your consumption and there are usually several free bottles of water in your room at each lodge and camp. Additionally, bottled water is available at all the lodges and camps for purchase. Stomach upsets are the most common traveler’s complaint. They range from mild discomfort to diarrhea. The vast majorities are harmless and quickly pass. Some digestive upset is probably inevitable for most people. Simple things like a change of water, food or climate can all cause a minor discomfort. When diarrhea occurs, there are basically two things you can do, stop it with drugs or let it run its course. The most common over the counter drug is Imodium. Your doctor may prescribe another medication to help the symptoms. What if I am diabetic or have medical problems? Traveling with Type 1 and Type 2 diabetes is a common concern with many travelers. In general there is no reason why diabetics can’t safely travel on safari! Here are few travel tips to help ensure you have a successful safari experience. Be sure to travel with a letter from your doctor stating which supplies you will be carrying (insulin, syringes, etc.) Having a copy of the actual prescription is a good idea too. Pack this, along with your prescription medication, in your carry – on luggage or keep it with your passport. Bring along more than one bottle of insulin. If on a pump, bring plenty of extra pump supplies along with you including extra reservoirs and infusion sets (you can’t buy them locally). Bring extra syringes as a back-up method to deliver your insulin in case your pump malfunctions. Always pack the insulin and back-up syringes in your carry-on. Bring an extra battery for your pump. Don’t forget your blood sugar testing meter and plenty of testing strips. Bring an extra battery for your testing meter. You’ll want to protect your insulin from getting too warm in the African sun, but please be careful about the electric “cool boxes” inside some of the vehicles; they cannot be trusted for insulin storage because they sometimes drop below freezing. This is also true for some of the coolers and “refrigerators” (run on generator) used at some of the lodges. We recommend bringing along a Frio cooling packet to protect your insulin from getting too warm during the day. The Frio cooler is small, lightweight, and easy to use because it is activated by water and will keep insulin cool for several hours. See Life Solutions Plus for more information. Bring hard candy or glucose tablets along in your carry – on luggage. Always carry some hard candy or glucose tablets with you on game drives, hot air ballooning, and any other activities. The meals you enjoy while on your tour will probably be a lot like you are used to eating at home – salad, soup, chicken or beef or pork, fruit, etc. Eating in the restaurants at the lodges is fairly easy, as there are always lots of items to choose from. When you are on game drives during the day, some days you might bring a picnic lunch with you; be aware there are usually a lot of high carb items like bread and fruit juice in the picnic boxes, but there are always other high – protein items too like hard boiled eggs and chicken. Just choose to eat the items that fit best within your diet regimen. Broad- spectrum antibiotics (i.e. Cipro)- be sure to know if any of your antibiotics will cause hypersensitivity to the sun. For detailed health information for travelers to all African countries visit the CDC Website. All travelers flying to Tanzania or Rwanda via or in transit through a Yellow Fever Infected Country (listed below) such as Kenya, Ethiopia and Uganda. For example, this would include those persons flying to Tanzania after staying in Kenya or Ethiopia. Even if you do not leave the Nairobi or Addis Ababa Airport and remain in transit, you will still be required to show the Yellow Fever Vaccination Certificate upon arrival into Tanzania. For those clients affected, please make sure you have a Yellow Fever Vaccination to prove that vaccine was given. Please pack this certificate in your carry –on along with your passport. Infant, children and pregnant women require special consideration – consult your doctor. What health concerns should I be aware of? Participation on our tours require that you be in generally good health. All guests must understand that while a high level of fitness is not required, a measure of physical activity is involved in all tours to Africa. It is essential that persons with any medical problems and/ or related dietary restrictions make them known to us well before departure. You must seek medical advice from your doctor or a travel clinic before you depart on your tour. Malaria is one of the greatest potential health risks in Tanzania and antimalarial drugs are recommended. The antimalarial drug named Malarone may be best choice and it should be strongly considered as opposed to other types of antimalarial drugs – consult your doctor or travel clinic. Other antimalarial drugs include Larium and Doxycycline. For detailed discussion on malaria and other different antimalarial drugs available, visit this CDC Website. Whether or not you are taking antimalarial drugs, it is important to protect yourself from mosquito bites from dusk till dawn. This is when the type of mosquito whose bite transmits malaria is active. Precautionary measures include using DEET based insect repellant, covering up before dusk and wearing long sleeved shirts, trousers, socks and shoes in the evening. You should certainly cover up and use insect repellant before going to dinner each evening. Pay particular attention to your ankles and legs as mosquitoes, if present tend to hover at ankle level. Travelers should be informed that regardless of the methods employed (antimalarial pills, other protective measures, etc), malaria still might be contracted. The Northern Parks and Reserves of Tanzania are not particularly high risk areas, however, it certainly does exist. Malaria does not pose a significant risk above 5,900 feet. The Ngorongoro Crater (altitude of 7, 500 – 8,000 feet) is Malaria free and there are few mosquitoes in most regions of the Serengeti (altitude of 5,000 – 6,000 feet). There is a high risk of malaria on Zanzibar and other low – lying regions in Tanzania. Malaria symptoms can develop as early as about a week after initial exposure in a malaria – infested area and as long as 1 year after departure from an area, after preventative medication has been completed. Travelers should understand that malaria can be treated effectively early in the course of the disease, but delays of therapy can have serious or even fatal consequences. Individuals who have symptoms of malaria should seek prompt evaluation as soon as possible. Will my cellphone work and will Wi-Fi be available? Cellular and wifi connection is not available in all areas. Different cell phone services will get better reception than others at times. If it’s important to stay connected with work or home while on safari you should purchase an international call plan (with your preferred cell phone service provider) for the duration of your trip. You also may rent a satellite phone from other satellite services such as Mobal. Some, not all, hotels, lodges, or camps offer wifi connection. Please inquire at each location where the designated wifi area is located. Yes, however at many locations electricity is only available at certain times of the day. Many of the lodges do not operate their electrical generators 24 hours a day. Some lodges turn off their generators after dinner and restart them in the early morning. The electrical voltage in Kenya and Tanzania is 220V while the electrical voltage in the United States is 120V. The electrical sockets are identical to those found in the United Kingdom. A 3 rectangular pin UK plug adapter #3G is required to use electrical appliances including laptops, tablets, video games, digital cameras, battery chargers, etc. The 3 rectangular pin UK plug adapter is placed onto your appliance plug so that it will fit into the 3 rectangular pin electrical sockets. You may wish to consider bringing along a multiple outlet device (a.k.a 3 –way splitter) to plug into the adapter, allowing charging of more than one battery or device at a time. Check out Walk About Travel Gear for the best solutions for electric conversion. If you have a dual voltage appliance or a universal power supply capable of operating safely with either 120V or 220V, all you will need is the plug adapter mentioned above. Most newer laptops, digital cameras and video cameras come equipped with a dual power supply. Check to make sure that the inputs read 100V – 240V or 120V – 240V. If you do not have a dual voltage power supply, then in addition to the plug adapter, you will need to purchase a transformer/converter. For more information, please visit Electrical Outlet. What is the climate like in Eastern Africa? The majority of the famous wildlife parks of Northern Tanzania (situated just south of the equator) rest upon an elevated plateau creating a wonderfully temperate climate. Average highs are in the mid 70’s to low 80s and average lows are in the 50s and 60s. The temperatures are very comfortable and there is little humidity due to the high elevation. The moderate climate creates a comfortable environment for wildlife viewing throughout the entire day. During mid-day it is rarely too hot for game viewing and many animals remain active. Full rainy days are rare and even during the green season (November to May), there is a greater proportion of sunshine and only brief and refreshing showers are the norm. Wildlife viewing is a year round event due to the equatorial climate and there really is no preferred season in terms of weather though some individuals prefer the green season as it’s not as dry or dusty. There are two unpronounced seasons in Tanzania including a green season from November to early May and a dry season from mid May to mid November. In most regions of East Africa, rainfall is usually higher in November and December (short rains) than in January and February (the short dry season) and then rain falls again in March, April and May (the long rains). However, this is not the case in Northern Tanzania and especially in the Serengeti National Park! The so called ‘short rains’ and ‘long rains’ in Northern Tanzania are significantly less pronounced and the rain tends to fall sporadically from mid November to late April or early May. It has been completely unpredictable during the last ten years as to which green season month or months receive the most rain. In any event, the sporadic rain showers do not hamper your ability to game drive and, in fact, only enhance wildlife viewing. There is an old adage in the Serengeti that ‘rain means game’ and this definitely rings true during the green season when the herds are on the vibrant green plains. What should I consider when booking airline flights? The cost of international airfare is not included in the tour package pricing. You will need to make these arrangements yourself, or we can assist you. We have found that although there are many airline travel sites to book your flight, you will find the best pricing and service by booking directly through the carrier. If your journey begins in Tanzania, the most convenient and efficient point of entry is via the Kilimanjaro Airport (JRO) in Arusha, Tanzania. The major airline serving Kilimanjaro is KLM, a code share partner of Northwest Airline (NWA) and Delta. If your journey begins in Kenya, the most convenient and efficient point of entry is Nairobi’s Jomo Kenyatta Airport (NBO). Major airlines serving Jomo Kenyatta are KLM (Delta/Northwest) and British Airways (BA). Flights can easily be booked directly at www.klm.com, www.delta.com, or www.britishairways.com. For planning purposes, you need to arrive no later than the day prior to start of your ground tour. See Tour Itinerary’s for more information. You may wish to add a 2nd night in the area at the beginning of your trip to recuperate from the flight and before beginning your safari. If you’re travelling from the USA, the flights typically consist of two segments including a layover in Amsterdam. Airlines may have significant layovers (2 – 6 hours or more) in the Amsterdam airport before the connecting flight. Accordingly, you may wish to consider this great little hotel, Yotel Hotel inside the Amsterdam airport (no clearing immigration or security) that you can book by the hour or overnight. Flight time from the east coast to Amsterdam is about 7 hours while it is longer from the west coast. Flight time from Amsterdam to Kilimanjaro or Nairobi is about 8 hours. The return flight times are a little longer. Upon arrival, we will greet you at the airport and transfer you to your hotel for dinner and overnight stay. Flights returning back to the USA from all airports depart late at night. As part of the tour package we include a day room at a hotel near the airport to shower and relax before your departing flight. You will be transferred to the airport for your departure. 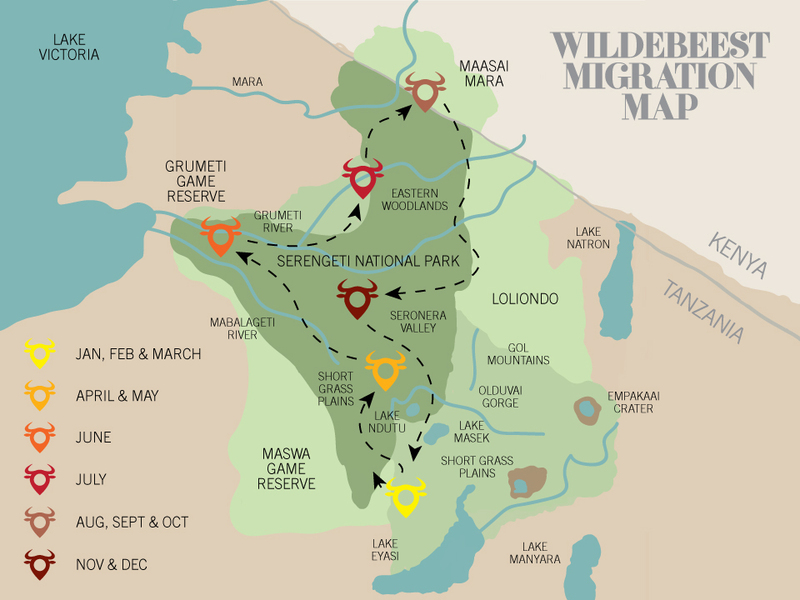 If you are planning a visit to East Africa seeing the Great Wildebeest Migration is something extraordinary. You should consider planning your trip according to their migration pattern. Part of the year the great herds are in Kenya and during most of the year they are in Tanzania. The iconic river crossings occur at the Mara River bordering Kenya and Tanzania, and the Grumeti River in Tanzania. 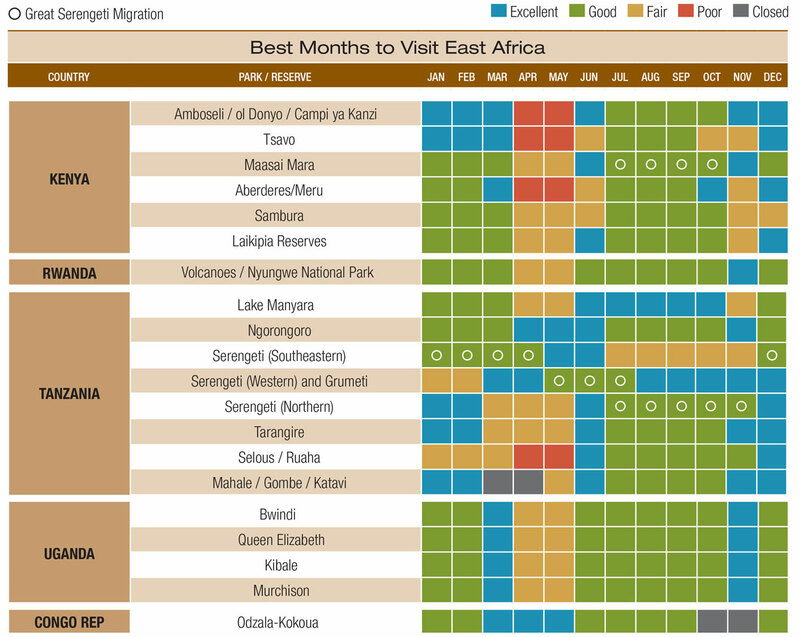 Here is a map that illustrates the best locations by month to view the migration. 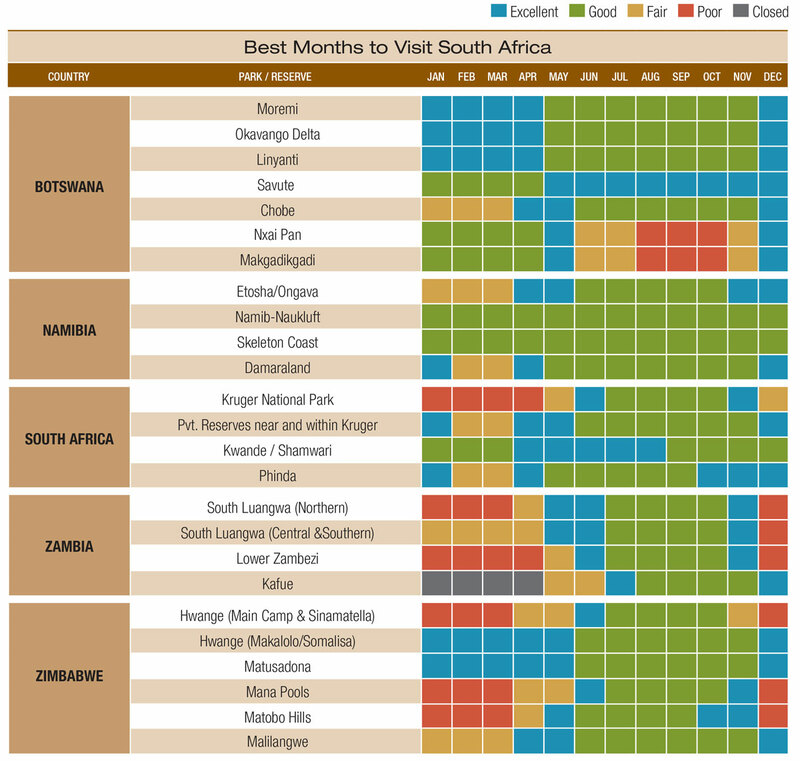 See the best months to travel to South Africa here. What is the best time of year to travel to East Africa? Visiting this area is wonderful year round, but there are some things you should consider. Seasons in East Africa are opposite of North American seasons. Summer is December through February; Autumn is March through May; Winter is June through August; Spring is September through November. Depending on the areas visited in Kenya, Tanzania, Uganda, and Rwanda you are either just north or just south of the Equator. The temperatures and rainfall will fluctuate with the seasons. Visiting during the dry season (Summer, Winter and most of Spring) ensures you avoid floods, mudslides, and downpours. The animals tend to congregate around predictable water sources during the dry season offering the best viewing opportunities. Temperatures are warm year-round with the hottest months in January and February and coolest in June and July. Animal births are an exciting time in East Africa. Watch thousands of new babies being born each day during Tanzania’s calving season from January to April. February is an ideal time in Kenya and Uganda. Wildlife like lions, hyenas, leopards, and cheetah are most active during these months as they stalk for prey. 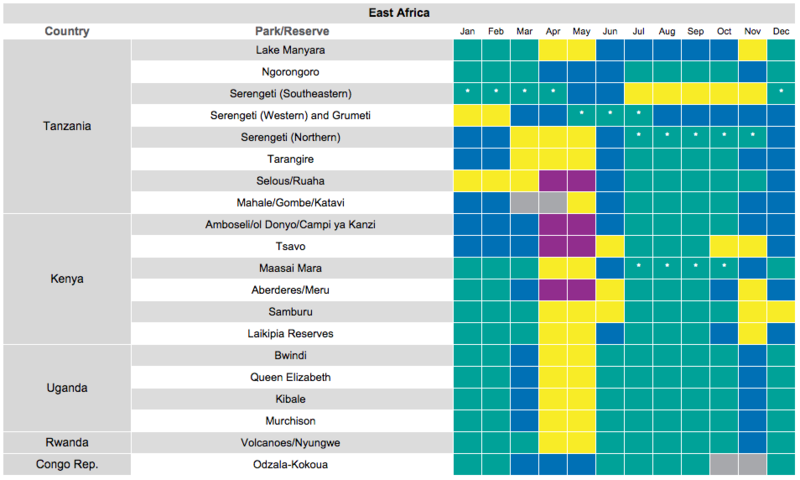 Below is an overview of the best months to visit East Africa’s National Parks and Reserves. Click on chart for larger view.